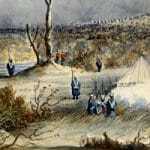 The Second Anglo-Sikh War of 1848-49 followed hot on the heels of the First Anglo-Sikh War of 1845-46. As a result of the first war the Sikhs had ceded Kashmir and accepted the presence of a British minister in Lahore, which gave the East India Company enormous power in the Sikh government. War broke out again in 1848 and the Sikhs were defeated, the entire kingdom of the Punjab being ceded to the British. The Sikhs were always highly regarded as warriors and soldiers by the British and were to become one of the jewels in the British Indian army’s crown until independence in 1947. The battle was fought to a bloody conclusion, with both sides claiming victory and licking their wounds. On 13th February Gough defeated the Sikhs decisively at the battle of Gujerat, and on March 12th the Sikhs surrendered. But, heavily criticized for his performance, particularly at Chillianwallah, Gough was sacked after the conclusion of the war and replaced by Sir Charles Napier. “I am commanded to request that you assure the Secretary of State for War [the Duke of Wellington] that nothing in the whole of the British Army ever was more distinguished than the conduct of the Regiment – 61st Regiment – throughout the late campaign, but more particularly at the Battle of Chillianwallah, where the conduct of the regiment was the admiration of the whole army. Picture: The British camp before Chillianwallah. Detail from a painting by W.E.D. Deacon. Original in the Soldiers of Gloucestershire Museum.